Cannonball Adderley: 'Somethin' Else' Alto saxophonist Cannonball Adderley, nicknamed "the New Bird" for his ability to play fast leads a la Charlie "Bird" Parker, swept on the jazz scene in the mid-1950s. On Somethin' Else, Adderley teamed with Miles Davis to create an album that jazz commentator Murray Horwitz calls "near perfect." 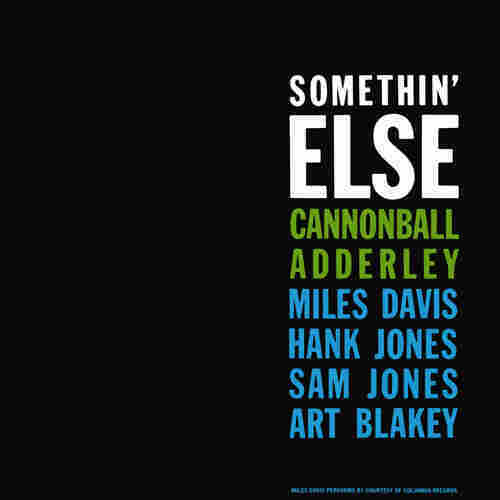 MURRAY HORWITZ, American Film Institute: That's the sound of the Cannonball Adderley Quintet in 1958, on a record called Somethin' Else, a record that, A.B. Spellman, you say is near perfect. A.B. SPELLMAN, National Endowment for the Arts: Absolutely, not a wrong note on it. Not a tune on it that's a throwaway. It is a marvelous record. We catch Cannonball Adderley here at his best, I believe, because Cannonball was such a fluid musician. He was a musician for whom playing was so easy, that sometimes it seemed that he wasn't even paying attention to what he was doing. He just played a lot of lovely little solos. But they don't stand out in the sense of the kind of permanence of great music that we look for in this collection. But here, Cannonball has been working with Miles Davis, and he's been working in a band with John Coltrane and Bill Evans. And you don't fool around in that band. You take things very seriously because there's some deep music being made there. This is the band that made Kind of Blue. So here, Cannonball, on his own date, somehow got Miles Davis to serve as a sideman, which is extremely rare. He's assembled a quintet of marvelous musicians. Hank Jones, too, is a very underappreciated Hall of Fame pianist. And of course you've got the great Art Blakey on drums and the very solid Sam Jones on bass, and they play perfectly on this record. MURRAY HORWITZ: That's the title tune from the album Somethin' Else and that wonderful conversation between Miles Davis on trumpet and Cannonball Adderley on alto sax. Tell me about those contrasting styles, because it's a wonderful coupling. It's like they say — a terrific conversation. A.B. SPELLMAN: Yeah, this is Miles' composition, "Somethin' Else," and it does have that kind of antiphony, that call and response that was at the very root of jazz. Jazz started here, in a manner of speaking. And so the voices, which are almost human voices, in a way, are of two guys who have a lot to say to each other. It's a very relaxed conversation, but it's a meaningful conversation as well. Cannonball is sort of playing to Miles, I believe, because he's playing sort of within Miles' context of a style. He's not going to throw a whole lot of notes up against Miles, who is going to play very few notes. Miles, as you know, is a master of selection. He is a musician who will select the most meaningful notes and give each one of them ultimate value. A.B. SPELLMAN: Cannonball is a musician who can play a whole lot of notes and so will put together very complex phrases. What Cannonball does here is sort of compromise his phrasing for Miles' seriousness of selection, and it works very, very well. MURRAY HORWITZ: I think one of the exciting things about jazz music is that you're always trying to catch lightning in a bottle as a listener and certainly as a player. That's what Cannonball Adderley did on March 9, 1958, and the result was, as you pointed out, some of the best work by two of the best soloists in jazz history. It's on the CD Somethin' Else on the Blue Note label. For NPR Jazz, I'm Murray Horwitz. A.B. SPELLMAN: And I'm A.B. Spellman.